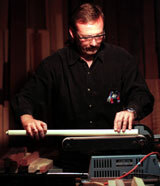 LEABURG - As a child, Jeff Calavan loved music, his woodworker grandfather and studying American Indian lore. In adulthood - Calavan turns 41 years old today - the lifelong Oregonian has managed to fuse all three passions into an after-work business he hopes eventually to make a full-time career. 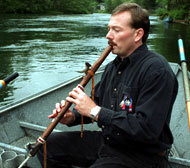 A boat in the middle of the McKenzie River is where flute maker Jeff Calavan goes to relax and to test out his custom-made instruments (above). Calavan custom-decorates his instruments for each individual customer (below). Evenings and weekends in the small, neat workshop in his home overlooking the McKenzie River, Calavan uses air-dried cedar, spruce, redwood, maple, cherry or walnut to create custom-made six-hole wood flutes in the American Indian style. Depending on the kind and length of the wood, the size of the bore and the placement of the holes, a flute may sound a sharp, clear pitch like a bird chirping from a tree branch or low like the wind through tall grass. American Indian wood flutes differ from others "because they're the only instrument where the air exits and then re-enters the flute," Calavan said. "That creates a bit of windy harmonic sound that no other flute has." Each American Indian flute has a carved "fetish" on top - traditionally representing an animal or bird important to the musician - that helps move the air from the first chamber to the second to achieve the special tone, he said. 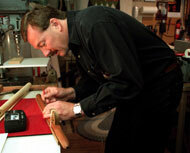 Making a flute takes many hours and requires painstaking attention to detail, Calavan said. Because wood fibers stretch or shrink with changes in temperature, a flute must be drilled and "tuned" in climate-controlled conditions. Very old, tight-grained wood works best, and each instrument must be "tweaked" individually to accommodate its special characteristics. American Indian folklore holds that a woodpecker actually created the first flute, Calavan said. "The story is that a brave went into the forest and watched a woodpecker pecking on a (hollow) branch - the wind blew through the holes and made a beautiful sound," he said. "The bird flew away, and the branch fell at the brave's feet, so he took it with him. Then people began making their own." Calavan spends 10 to 14 hours carefully crafting each instrument in his home workshop. Calavan proudly admits he's come a long way since the first rudimentary flute he made a decade ago before a vacation trip to the Warm Springs tribal resort in Central Oregon. "I was always a musician - I started playing drums in fourth grade and played all the way through college," he said. "I always liked to have an instrument with me, but you can't carry drums everywhere." Having inherited all the woodworking tools from the grandfather "who had always been very inspirational to me," and coming across a childhood book called "Ben Hunt's Indian Crafts" that contained directions for making a wood flute, Calavan suddenly got the idea of crafting one to take along on his trip. "I didn't know anything about flutes, but it turned out - it played," he said. That success, combined with "a personality that when I get into something I go all the way with it," launched him on his avocation. Calavan now creates several custom-made flutes each month, special-ordered by people as far flung as Greenland, Korea and Australia. He carves the "spirit end" and fetish of each instrument to suit its future owner and works with a local artist if a purchaser wants images painted on a flute. One recent unconventional order came from a New York man who ordered twin flutes for his children, topped with fetishes representing the family's beloved black Labrador retriever and painted with scenes of the dog running after a thrown object on one side and returning it to its young owners on the other. To make the bodies of each custom-made flute, Jeff Calavan chooses from the collection of recycled woods stored in his home workshop. Calavan's finished instruments - which usually vary in cost from $280 to $800 - also may be fitted with hand-beaded or leather "flute wraps" and come with a handmade woolen case fastened with an abalone button. But that's only part of Calavan's business dream, and growing reality. Already a full-time sales manager in the green pallet division of The Weyerhaeuser Co., he has limited time to devote to his flutes. So it's up to his wife, Jo Ann - both Calavans have business degrees - to carry the family business further. From their McKenzie River home, Jo Ann Calavan manages The Oregon Flute Store, a 4-year-old mail order business that sells not only Jeff Calavan's hand-crafted instruments but also flutes created by nearly a dozen other master flutemakers - including some American Indian - from throughout the country. The couple also markets hard-sided cases for transporting flutes as well as decorative flute stands, music, instructional videos, tapes and compact discs of American Indian flute music and how-to books. "We're the only ones I know who do what we do," Jo Ann Calavan said. "Our whole concept is the store - flutes, cases, books, CDs, stands - whatever you want, you can find with us. That's a big piece of why people come to us." Growth of the business has been slow but steady, "but we've just gotten to the point now that I'm paying myself a small salary," she said. "The best part is that through the flutes, we become people's friends - they share their dream with us and we make it for them."